Yesterday evening (23 April) was cold and felt rather ‘unfishy’. But John Wood, the factor from Glamis, fished the two upper beats, from the A90 all the way down to the Aqueduct. Nothing much doing in the Milton Beat pools, but he lost a fish of about 12lbs in Kirkinn (which is really the tail of the Red Brae) and then caught a pristine 13lbs salmon off the bushes just above the Aqueduct at the tail of the Beeches Pool. John said it was a cracking fish in tip-top condition, which of course he carefully returned alive to continue its upstream journey to its predestined, genetically programmed spawning burn, probably way up the Glen. So that is nine spring salmon so far. Just above average and still another week to go before the end of April. With a massive volcanic cloud hanging above Finavon, Moray Macfarlane, Finavon’s fishery manager, caught a beautiful 16lbs salmon in Tollmuir Pool in a falling river and crystal clear water. This is the biggest fish of 2010 so far and it was in near-perfect condition with a smattering of sea lice to vouch for its fresh arrival from the North Sea. What a great fish! It took Moray nearly 30 minutes to land, and it was of course duly returned to the river after a period to recuperate under his care. 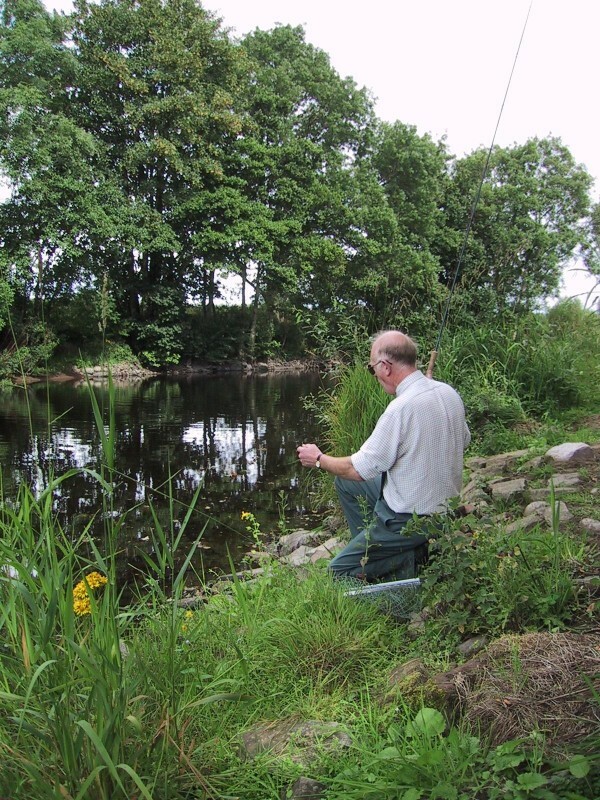 We have long expected Tollmuir Pool to start delivering catches of both salmon and sea trout, and already, early in the 2010 season, this pool is starting to show its potential. Taken with the Marcus House Pool, now exclusive to FCW rods, Tollmuir gives Bogardo Beat some top quality fishing. With three good pools on the beat – Haughs, Tollmuir and Marcus House – I expect Bogardo Beat to perform much better in 2010, both in absolute terms and relative to the other Finavon Beats. And the sea trout and grilse have yet to arrive! Let’s see what Tollmuir Pool produces then. There are still some days left on Finavon’s four beats this year. With the season shaping up well it is time to think seriously about your first visit to this wonderful water, or perhaps coming back after an absence. You won’t be disappointed! Later report from Tollmuir Pool on 22/4. 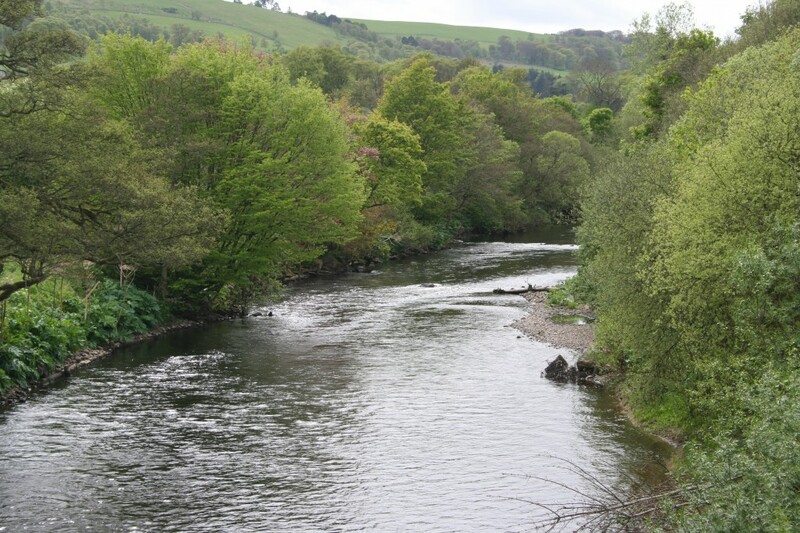 Derek Strachan fished Tollmuir on a very cold evening (5.0c) and, with the water now quite low, still dropping and very clear, the few spring salmon in the river have holed up in the deeper pools, of which Tollmuir is one. He saw fish, but they just weren’t interested. Until there is more water – and as I write this blog on 23/4 it has been pouring all day -it will be hard to tempt a salmon. With a freshet there should be more spring fish in the river. Here’s hoping! This very brief tribute to Alasdair is overdue. He was my friend, employee and partner in the Finavon adventure, and he died at the age of 69 of cancer on 23 December 2009. The last twenty five years at Finavon would have been poorer had he not been here working with me on the development of the fishery, which is a fine example of a beat on a Scottish salmon river, in no small measure because of Alasdair’s commitment to it over 20 years. 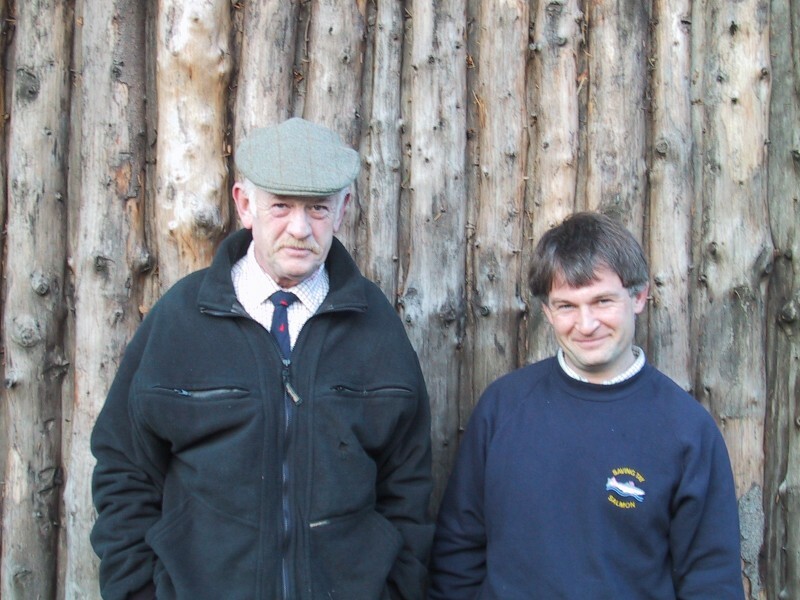 Alasdair was the river keeper and ghillie at Finavon from 1989 to 2008. During this time he looked after hundreds of visiting fly fishermen and their friends and families, keeping their morale high, even in the most unpropitious conditions, with his unending stream of jokes and good humour. His knowledge and love of the South Esk, combined with his meticulous attention to the needs of his customers and the riverbanks, gave the Finavon Castle Water a champion throughout his long service. 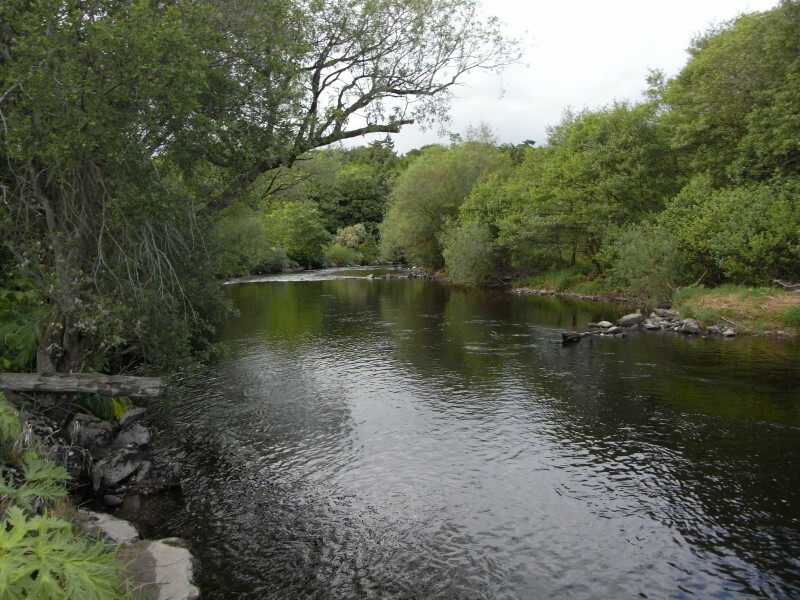 His love of the River had an obsessional side: he couldn’t bear to see litter, especially polythene bags hanging in the branches of river bank trees after a flood, nor could he abide the sight of the invasive weeds which take over the riverside in the summer. I would often find huge quantities of seedling Himalayan Balsam or Giant Hogweed left in piles beside the hut, a visible result of Alasdair’s obsession with their eradication! Alasdair was the best of the old style ghillies, but he also had a modern approach to his work by recognising that the fishing tenants were his customers and that he was responsible to a large extent for their enjoyment of time spent on the river. Many of FCW’s international tenants, Godi Donnersmarck from Austria, Hiro Soda from Japan, Earnley Gilbert from England, Sennen Paz from Spain, Erik Alstrom from Finland and many many others became close personal friends of Alasdair. He often went to Finland, Iceland or Austria as their guest with his wife Elizabeth, who is a well known local artist and whose paintings of Finavon are much admired. Alasdair was brought up in Dundee and excelled at school, especially in English and Latin. At 16 he joined the Royal Navy and was a ‘Button Boy’ at HMS Ganges (Where he stood at the apex of the huge mast 100′ above the parade ground). He then joined the police and afterwards the prison service before doing what he had always wanted by living in Angus and getting involved with shooting and fishing. He was an ardent reader and a considerable expert on the Second World War. He was also a prolific poet and writer. Over the years 1990 to 2005 he kept a detailed logbook of his observations from the riverbank. Red squirrels, ospreys, otters, stoats, roe deer, and the huge variety of butterflies, moths and birds we see at Finavon were all observed and recorded, and interspersed with his own poetry, some of which deserves a wider readership. I have promised myself that one day I will use the FCW logs as a quarry to write (with Alasdair at my side) about Finavon and the South Esk. Alasdair was one of those original people who left a mark on people much greater than might at first appear from where he worked and what he did. I often think of his 20 years at Finavon as an insciption on ivory. By this I mean that he worked in the detail of a small part of a little river in East Scotland. But the people he met and influenced, and his own resulting impact on their lives, made him much more important than his localised life might seem. Alasdair was a highly intelligent man. In my opinion he could have done many different things with his life; for example, he could have become a senior police officer or prison governor; or he could have been a musician (he played in a well known Dundee group as a teenager), or a stand-up comedian (ask anyone who heard Alasdair in full flow: they would agree!). We were all lucky that he chose Finavon, and he is already greatly missed. 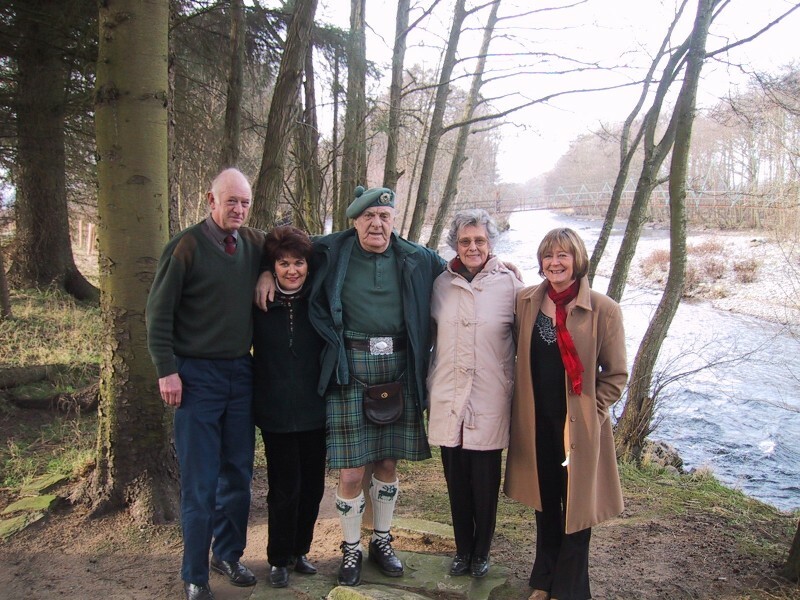 Alasdair is survived by his wife, Elizabeth and his children Mark, Barrie and Karen and his step children, John and Wendy. TA.